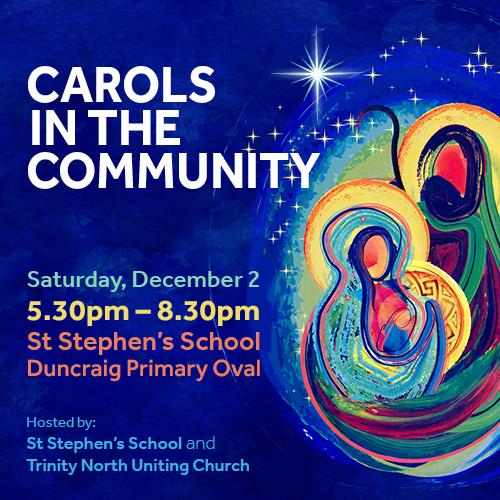 Get into the spirit of Christmas at Carols in the Community, hosted by Trinity North Uniting Church and St Stephen’s School, on Saturday, December 2. Gather family and friends from 5.30-8.30pm for an evening of Christmas Carols and festive cheer, led by the Balga Community Band with traditional songs and old favourites on the program. Santa will make an appearance to hand out treats to the children while a Christmas-themed arts and craft market will be a great spot to grab Christmas gifts and decorations. Families can also work together to build a traditional wooden manger at the Make A Manger workshop and learn about the true meaning of Christmas. Book a family spot for $25 at trybooking.com/SREV. Note: The workshop starts at 5pm before the Carols begin. Proceeds from a sausage sizzle will go to the Salvation Army run Balga Early Learning Centre. Ice-cream trucks and coffee vans will also be on site. Guests are welcome to pack a picnic, a picnic rug and low-lying chairs. Carols in the Community will be held at St Stephen’s School Duncraig Primary Oval (100 Doveridge Drive, Duncraig). Parking available in the school carparks and on Doveridge Drive.